Some excellent single harvest colheitas were produced in 1974, making a port from this year the ideal 45 year old wine gift for a 45th birthday or anniversary. 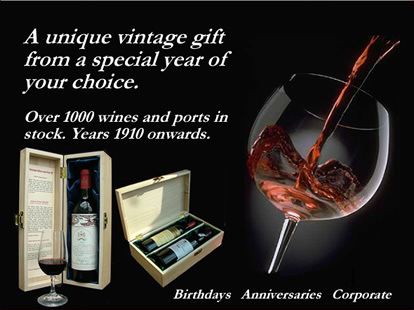 For vintage ports it was a moderate year that was not declared by the major port houses; despite a huge crop, very few vintage port wines were bottled from this year and the bottles that were produced are very rare. 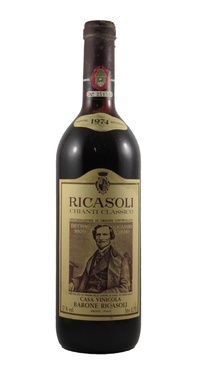 Celebrated as a great vintage in Italy at the time, the 1974 vintage is now still considered to be very good. The 1974 vintage produced a large crop, close to the 1964 but with less quality. Summer was hot and dry and a mild autumn allowed the grapes to ripen fully. The wines produced are characterised as being fairly firm and tannic with low acidity but good, rich fruit. The harvest time was very long and lasted through November. Wines produced in this year have reached full maturity but continue to hold. A massive crop was produced, but the 1974 wines were hard and tannic and lacked the ripeness of the 1975 vintage. Although the wines will not improve further with age, they are still very drinkable now. Chateau Magdelaine is a small estate whose vineyards extend on to the famous St Emilion limestone ridge (Ch. Ausone). The wines on this Chateau were Merlot dominated as the Merlot grape performs particularly well on these limestone-rich soils. Chianti is Italian wine from the Tuscany region. Located in central Italy along the Tyrrhenian coast, Tuscany is home to some of the world's most notable wine regions. The 12th century winery estate of Castello Di Gabbiano is located in the rolling hills of Tuscany, just south of Florence. The winery produces traditional Tuscan wines. This third growth Saint-Julien property dates back to 1796, when it was founded and heavily expanded by Napoleon’s finance minister, Count Jean Valère Cabarrus.